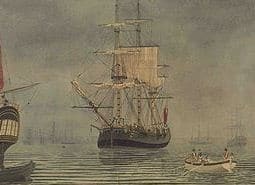 On the recommendation of Joseph Banks, botanist and explorer, the eastern coast of New South Wales was selected to become the new penal colony to relieve pressure on the overcrowded prisons and prison hulks in Britain. This was an ambitious undertaking by any standard and ‘farmer’ Captain Arthur Phillip, was the man selected to command the operation. Let us take a moment to consider what was being asked and decided upon. Convicts from all over the counties were meant to be taken to relieve pressure on their gaols but in the event most came from gaols in London and Middlesex. These prisoners were in a pretty awful physical condition, diseased and malnourished, they would be at sea for months and when they arrived there was much to do to make a settlement. Eleven ships finally sailed from Portsmouth on 13th May 1787.